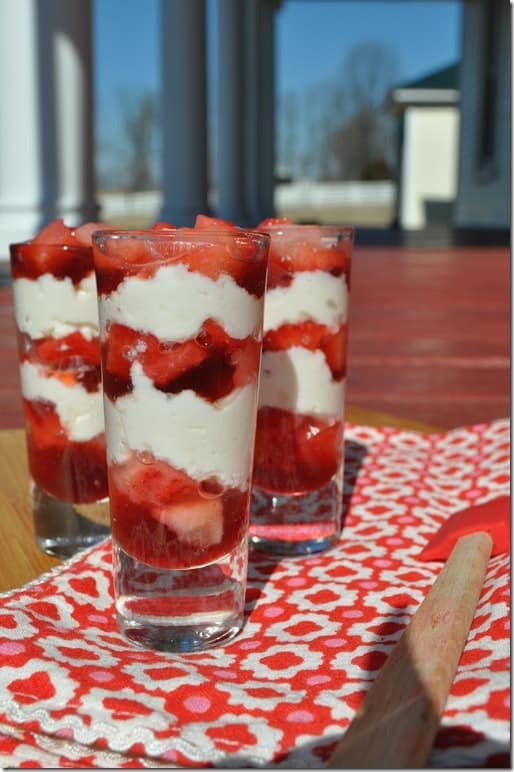 This recipe makes about 4 miniature parfaits (in shot glasses), or one regular-sized parfait. Since it’s “Dr. Seuss Week” at our house, I knew that I wanted to create a red-and-white “Cat in the Hat”-themed treat, but I also wanted it to taste great. My solution? 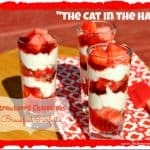 These absolutely delicious “Cat in the Hat” Strawberry Cheesecake Breakfast Parfaits. They sound totally decadent, but they’re actually a healthy way to start your day. The “cheesecake” is really just some protein-rich ricotta cheese, mixed with a little bit of vanilla, sugar, and salt for extra flavor. 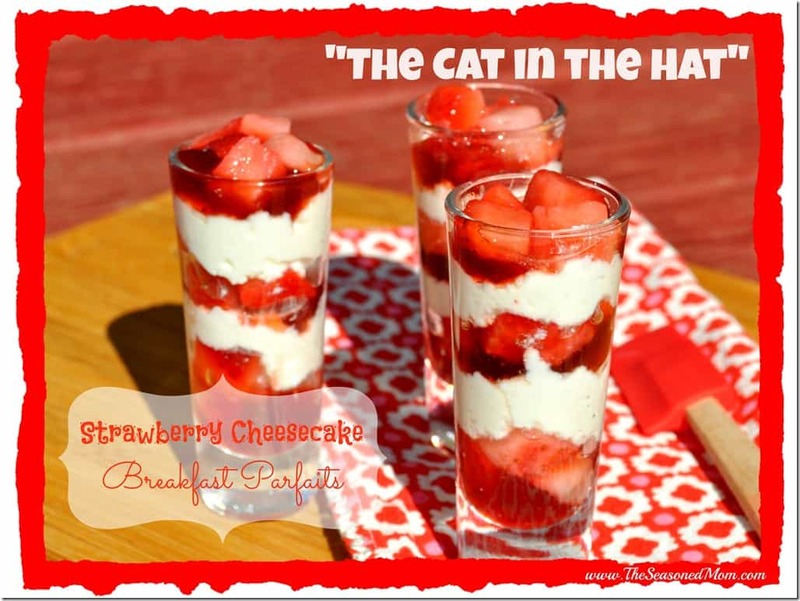 Add some diced strawberries and a bit of strawberry preserves and you have an amazingly tasty breakfast that’s very similar to a fancy, rich cheesecake…minus most of the calories. Serve these with graham crackers or toast for a balanced breakfast or snack. The parfaits pictured are actually “mini” parfaits that I served in little shot glasses. They’re perfectly kid-sized, and would also be cute on a dessert or breakfast buffet at a party. Enjoy these year-round, even when it’s not Dr. Seuss’s birthday! Mix all cheesecake ingredients together in a small bowl. In a tall glass, or in 4 shot glasses, place 1 Tablespoon of strawberry jam. Top with sliced strawberries. Evenly spread about ¼ cup of cheesecake mixture over the strawberries. Repeat layers. Previous Post: « What We’re Doing: Making Oobleck! That so looks like his hat, fun!!! It’s all Cat in the Hat here, too, with the kids celebrating reading at school all month. What a great breakfast! be daunting. Click on Share My Media, that can bring up any devices it is possible to share with. could have on floors and, more importantly, on any neighbors who live using your living area. Sometimes, you could possibly see a faint smoke followed by a faint give an impression of burn electricity.